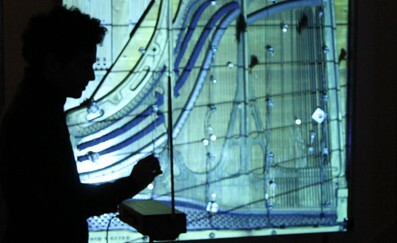 Piano Migrations transforms the inside of a recycled piano into a kinetic sound sculpture. Dozens of small birds landing on telegraph lines appear to flutter and settle on its strings: the movements of the birds trigger small machines to twitch, causing the piano strings to resonate. 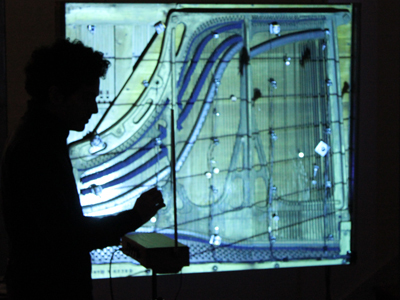 In Piano Migrations nature appears to control machines as they come together to create a delicate and ever-changing musical score. The installation transforms into a live performance with Kathy Hinde and Matthew Olden. Videos of migrating birds are mixed live to create a constantly shifting graphic score, generating new sonic responses from the piano. This is augmented through live sampling, field recordings and instruments made from customised parts salvaged from dismantled pianos. The Arts Desk; Sonica Festival, Glasgow 2013.